Light novels appear to be a newest growing trend among the American anime market. Tokyopop has recently released a number of books that have gone on to become well known in the US for their anime adaptations, such as Crest of the Stars, Welcome to the NHK, and The Twelve Kingdoms. Del Rey will also be releasing Faust Magazine this summer, which is an anthology of written stories and anime illustrations. With all this buzz, I have found myself also getting into the whole light novel scene. In fact, I think that I have read more light novels in the past couple of months than I have read comics. So when Seven Seas offered to send me a review copy of one of their new lines light novels, I more than happily selected one from a favorite series of mine, Pita-Ten. 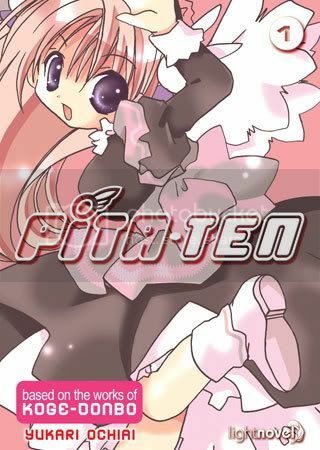 Pita-Ten originates from the 1999 manga by DiGi Charat creator Koge Donbo. It is the story of Kotarou, a normal kid whose family life is filled with great tragedy. One day, a hyperactive angel-in-training, Misha, shows up at his door and makes it her personal mission to cheer up the lonely boy. Joining the cast are Kotarou’s two best friends, the cute catgirl Koboshi and the pretty boy Takashi, the sweet-as-sugar demon Shia, and the arrogant rich boy Hiroshi. The manga was adapted into a 26-episode anime in spring of 2002 and has quite possibly the cutest theme song I have ever heard. A series of three light novels by writer Yukari Ochiai were also released that year. The anime still goes unlicensed, but Tokyopop has had the entire manga series released in the US for quite some time now. Seven Seas brings back the franchise with the release of the first Ochiai light novel earlier this month. Ochiai makes this light novel a “prequel” to the manga series with four episodes about the how the characters got to where they are. The first story shows the tragic events of Kotarou’s childhood and how he became friends with Koboshi and Takashi. The second story is about Misha’s final adventure in Heaven and how she decides to go to Earth. The third story is about Shia’s first encounter with a family on Earth, and the fourth is a goofy look at Hiroshi as he prepares to enter the series. First of all, I have to start by saying one extreme disadvantage the novel has when comparing it to the comic or anime is the lack of Donbo’s beautiful visuals. Donbo makes being “cute” a work of art, and has quickly won me over as being my favorite female manga artist. However, while her pictures are all phenomenal, her stories tend to be very subpar. The light novel, by nature, only features a hand-full of illustrations. Without the visuals, Pita-Ten would require some serious re-tooling for it to be decent enough to read. That’s why I’m glad that a writer is put in charge of creating the novel instead of Donbo, because they would have a better understanding of how to write prose. The difference between reading a novel and reading a comic is that former requires me draw images from my own experiences in order to visualize the story. This becomes very difficult to do when reading Ochiai’s Pita-Ten because the story becomes too fanciful and cartoonish to even possibly imagine. I became very annoyed with this problem when dealing with Misha’s character in the second episode. Her actions and speech are so outrageous that you have no choice but to see her as an anime character. If I could easily picture anime characters and scenes like that in my head, I would be a manga artist. But I’m not, so I found this story to be completely unreadable and I was begging to just be able to read this episode as comic instead. Surprisingly, this has been the first light novel I have ever had difficulty in believing. Kotarou’s story in the first episode is not quite as crazy as Misha’s, but it also suffers from complete unbelievability. This is mainly because the story takes place when when everyone is in Kindergarden, but Kotarou still talks like an emotional teenager. Again, this kind of thing would be okay if this was a comic. In a comic, they might set it up as him being in Kindergarden, but Kotarou is not a Kindergardener, he’s a cartoon character. If you can visualize a big-eyed kid with spiky hair, then you can easily suspend your reality enough to believe he can talk like a teenager or adult. But when reading it in a novel, it just makes you go, “Wait a minute… there’s no way that a little kid would possibly say something like that!” and you’re taken out of the story very quickly. However, when Ochiai goes away from the cartoony manga and focuses more on original characters and plot, this novel becomes quite enjoyable. Shia’s story in the third episode was very good. She becomes friends with a family of three boys, a father, and an only daughter. Because they have trouble maintaining their house, Shia finds a little niche for herself by doing the housework. But this slowly becomes a source of problems for the family when the only daughter begins to fear that Shia is replacing her role in the house. While the plot of Shia’s story might be a little dull when compared to the others, it is entirely believable and works great in prose. The only “fantasized” element in this episode would be Shia’s talking cat, “Nya.” But this aspect is not too farfetched and is easily imaginable. It was a great read, and I wish the entire novel was written with this type of story. I was also about to completely throw away the slap-schtick fourth story if it wasn’t for a hilarious bit where Hiroshi goes shopping with two kogals in Shibuya. When Hiroshi first encounters the girls, he berates them for sitting in their squatting positions. This reminded me a lot of an email I got from reader about these squatting girls, which I posted towards the end of this post. So I found Hiroshi’s interactions with these new characters to be very amusing. Again, by stepping out of the “Donbo manga” mentality, Ochiai can write a very enjoyable novel set inside the Pita-Ten universe. And I do have to give credit to Seven Seas’ production of this novel. Novels take a lot more effort to translate and adapt than manga does, and a bad adaptation would be painfully obvious to any reader. But Seven Seas’ adaption flows perfectly in English with absolutely no noticeable hiccups. It also appears that they took to the time to research how Tokyopop handled the manga adaptation and followed those choices very closely. This allows anyone who has already read the manga to feel very comfortable when switching over to the novel. And at a price point of only $7.95, you get more hours of entertainment with your money than you would with a comic. That’s why I’m really sad that their source material in this release is just not all that enjoyable. Pita-Ten works great as a comic with Koge Donbo’s beautiful artwork, but Yukari Ochiai fails to turn it into a functional written novel. I suppose if you were really a die-hard fan of the series and could easily visualize the cast’s crazy antics, then the light novel could satisfy your craving for more stories from the Pita-Ten universe. But if you are just a casual fan of the series and enjoy a good read, then you are better off just sticking to the comics. If there is one thing I can give Ochiai credit for, it’s that she did get me interested in the characters again. After I finished her book, I went back into my collection and dusted off the ol’ Pita-Ten manga to read again for the first time in years. This entry was posted on Wednesday, March 26th, 2008 at 7:17 pm by Scott	.